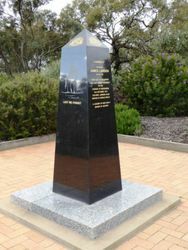 A monument commemorates local men of the 4th Light Horse Regiment and Colonel James Lawson who led "A" Squadron, in the charge of Beersheba during World War One. Colonel James Lawson is given special recognition on the memorial. 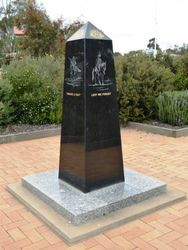 The Light Horse Brigade started in the Wimmera and was based in Horsham. Wimmera riders led the charge. 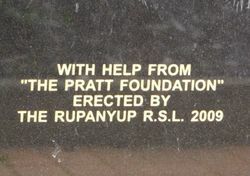 So it is very important to the area. 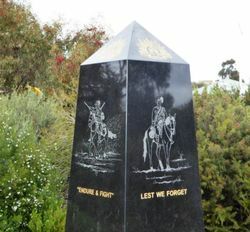 Colonel Lawson, then Major Lawson, led one flank of the charge on Beersheba, and returned to the Wimmera after the war ended. 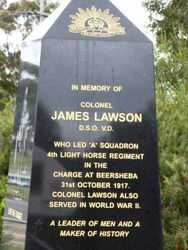 James Lawson came to Australia in 1905 by 1912 he was a hotelkeeper at Rupanyup. On 20 August 1914 he joined the Australian Imperial Force and embarked for Egypt with the 4th Light Horse Regiment. They served dismounted at Anzac from 20 May 1915 until the evacuation; Lawson had been promoted lieutenant in February and in January 1916 in Egypt he became commander of 'C' Squadron. In 1916-18 his regiment served with the Egyptian Expeditionary Force under General Sir Edmund Allenby in Sinai and Palestine. Lawson was promoted major in May 1917 and from then commanded 'A' Squadron. On 31 October 1917 Allenby, planning his main advance through the heavily fortified Gaza area, made a diversionary thrust at Beersheba. British infantry on the south-west formed the guard, while Australian cavalry charged the Turks from the south-east. Lawson's squadron and a squadron of the 12th Australian L.H.R. led the attack, storming the enemy trenches with wild and spectacular success. Lawson's leadership and personal valour in this key operation won him the Distinguished Service Order. He returned home in January 1919 and his A.I.F. appointment ended in April. 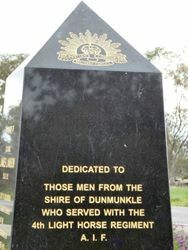 He became a stock and station agent at Rupanyup, reverting to part-time soldiering with the Australian Military Forces as a major in the 19th L.H.R. ; he was promoted lieutenant-colonel and commander of the regiment in 1927. 4th Light Horse Regiment A.I.F.